Southern Railway Apprentice Recruitment 2018-2019 Notification is available now. All the interested contenders who are waiting for Railway Jobs can apply for 2652 SR Trade Apprentice Vacancies. Lately, the Southern Railway has issued the Southern Railway Recruitment 2018-2019 on their official web portal that is www.sr.indianrailways.gov.in. So, all the job seekers are looking to know about the Eligibility Criteria details can get it from this article. Moreover, to give the accurate information regarding Southern Railway Job Vacancies 2018-2019, we have verified the complete Advertisement and gathered all the eligibilities and equipped in the next sections. Therefore, contenders who are planning to apply for www.sr.indianrailways.gov.in Recruitment 2018-2019 are suggested to go through the below sections and grab the valuable stuff like Age details, Education Qualification, Selection Procedure, Salary Details, Post Wise Vacancy Details, Application Fee etc. The final date is 11th April 2018. Along with Southern Railway Apprentice Recruitment 2018-2019 Notification, most of the job fighters are requesting us to attach the Southern Railway Recruitment Application Form 2018-2019. For the sake of people, we have also given the direct Application Form at the end of this article. Without late just refer the entire article and apply on or before the closing date that is 11th April 2018. Also, we all know that Trade Apprentice consists of many vacancies. We have discussed the Post Wise Vacancy Details in the below sections. And the main instructions from the Southern Railway Officials are those who have already applied for the Southern Railway Recruitment 2018-2019 need not apply again. So, keep in mind and proceed with the further steps. Kindly, check the below sections to get furthermore info. Have you been completed your 8th, 10th,12th Pass under 10+2 system? And waiting to make your bright future into Railway Department? Then here is an extraordinary opportunity for the contenders. 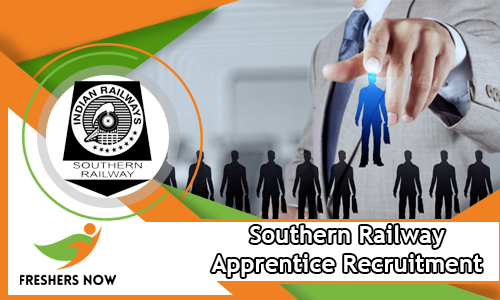 However, the Southern Railway Apprentice Recruitment 2018-2019 is out. The officials are mentioned that there are seeking for the competitors those who had done their 8th, 10th, 12th from any recognized Board or Institute are only eligible to apply for Southern Railway Job Openings 2018-2019 for 2652 SR Trade Apprentice Vacancies. Keep in mind that you have to apply through Offline Mode. Moreover, you have to download the Southern Railway Application Form 2108-2019 first. After that check the eligibilities and send before 11th April 2018 for the official’s address. For the convenience of people, we have given the Official Address at the end of this post. Right now, we are discussing the Age Details. The department of Southern Railway has specified that those who are planning to apply for Southern Railway Apprentice Recruitment 2018-2019 must have Minimum 15 Years and Maximum 24 Years. Already, many of the people have the exact age and feeling very happy to apply for Southern Railway Application Form 2018. Also, the Age Relaxation is applicable for the candidates. So, contenders belong to OBC have the upper age up to 3 Years. And 5 years for SC/ ST people at the same time 10 Years for PWD (Person with Disability). To get the complete Age Relaxation details just click on the below given Official Advertisement and verify the complete details. We are sure that the current SR Trade Apprentice Recruitment 2018 are the best chance for the jobless candidates. Remember that you have to satisfy all the eligibility criteria. We are instructing the contenders that, at the time of Southern Railway Apprentice Application Procedure 2018-2019, the authority will be very strict. The selection of the candidates is based on the Merit List. So, there is no worry about the selection. Because most of the people will feel very tense about the rounds of selection. Moreover, the selection for current Southern Railway Job Openings 2018-2019 is Merit Based. And all the selected contenders can get an excellent pay from the authority. And, you have to pay an APplication Fee as per the category wise. 8th, 10th,12th Pass under 10+2 system or equivalent from a recognized Board or Institute is the eligibility to apply for Southern Railway Apprentice Recruitment 2018-2019. To get the complete Age Relaxation details open the official Southern Railway Apprentice Recruitment 2018-2019 Notification and check. Refer the Official Southern Railway Apprentice Recruitment 2018-2019 Advertisement for Application Fee details. The selection of the candidates is based on Merit List. The Southern Railway is ready to pay the excellent salary for the selected contenders. So, check the complete vacancy details from here. Also, take a print out for the further use. We have arranged all the Southern Railway Apprentice Recruitment 2018-2019 in the above sections. If you have any query leave your valuable comment in the below comment box. Also, check the Official Advertisement. Hence, visit our website Freshers Now frequently.